Em270 from Canada, at RF, posted a link to Kate's Rosacea non prescription treatment for rosacea blog, permethrin 5% scabies, which lists a long list of over the counter treatments for your consideration. If anyone confirms this works for rosacea, please post in this thread. I can't find any product at the USA Amazon site that comes close to this treatment. If anyone does find something at Amazon, please post in this thread. Kate says she uses Quellada Lotion available in Australia. 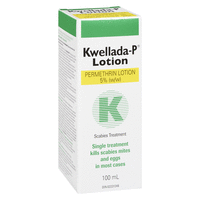 She says it is available outside of Australia as Kwellada-P available at Amazon Canada. A Journal of Family Practice article says, "Using intention-to-treat analysis, permethrin 5% cream was as effective as metronidazole 0.05% gel and significantly superior to placebo at improving erythema (change from a baseline score of 2.60 to 1.34), papules (change from baseline count of 6.04 to 1.73), and pustules (change from baseline count of 2.30 to 0.56)." This same article reports, "Permethrin 5% cream is superior to metronidazole 0.75% gel and placebo in decreasing Demodex folliculorum, and is as effective as metronidazole 0.75% gel in treating erythema and papules." It is apparently odd that you can't purchase this product over the counter in the USA, however, according to this article you can purchase it on ebay. I did find a 1% Permethrin cream at Amazon.